Some like it sophisticated, some like it country. Both are enchantingly represented in this exciting floral arrangement. Surprise someone today! 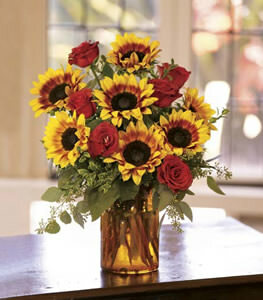 An amber vase (not available in all areas), filled with bi-color sunflowers, terra-cotta roses and oregonia, accented with seeded eucalyptus. Thank you so much for fantastic service! G/f loved the flowers and you saved me from a breakup!! Thank you again.